"Conductor Lawrence Isaacson, with gentle waving gestures, pulled carefully crafted phrases from the ensemble." "Isaacson’s selection of works was inspired." "Isaacson … is an interpreter of sound musicianship and intelligence." 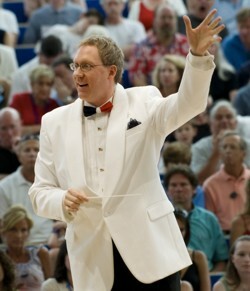 "Mr. Isaacson has demonstrated obvious abilities in planning rehearsals and in communicating efficiently with the members of the orchestra. His easygoing manners and stage charisma are impeccable." "His professionalism and engaging podium demeanor invigorates the musicians while his personality and charisma readily engage the audience." "I have been very impressed with how quickly you can get the orchestral musicians to play with the proper style and focus. There's nothing quite like the experience of having played in orchestras to give you a good idea of how to communicate and not waste time! I have really enjoyed working with you…"
"Lawrence Isaacson, the ensemble's conductor, possesses a fine ear and a bundle of enthusiasm for original, compelling and exciting music." "Mr. Isaacson’s conducting was like 7-up—clear, clean, crisp, with no aftertaste—really nice, classic, beautifully concise conducting."